Yeah, but: What can change in a year? The Long Version: The Billingham Hadley Pro has been my main camera bag for over a year now, so it's time to take a look back and see how it has performed. 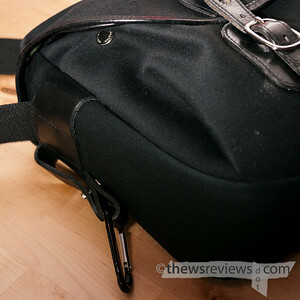 The initial review of it is here; it provides some background on what the bag is, what it holds, and how it compares to the more common Domke bags that (superficially) share its specifications. Since that was written my Hadley was with me on a day trip to Chicago and a ten-day stay in New York City; in this past year I've bought three new cameras, eight more lenses, and even another camera bag. This review is looking at everything I've learned in that time, and how my opinions and the bag have changed. Camera bags are one of those things that get outgrown as equipment changes, but I'm pleased to report that my Billingham has been immune to that problem. 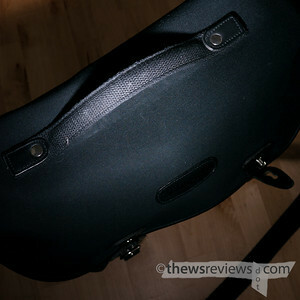 Everything that's packed into my Hadley Pro in the lead photo for this review has joined my collection after I bought the bag. The left side has a 500ml water bottle, and the centre has a Hasselblad 500c/m medium format camera. (Note that it's wearing the CF150 f/4 Sonnar, not the smaller and more common 80/2.8 Planar.) Rounding out the contents is a Zeiss Ikon with a 1,5/50 Sonnar attached, and it's sitting on top of a 2/35 Biogon. There's also the paperback novel that's artfully peeking out of a pocket, and plenty of room for film and other necessities in the other pocket: this bag is ready for a day doing just about anything without looking overloaded. There are a few reasons why the Hadley Pro has outlasted the other bags that I've bought. For one thing, it's such a great size that it's the bag to buy even if something smaller could do the right-now job, so it's not likely to be outgrown. And speaking euphemistically, having one is such a luxury that not using it simply isn't an option; there's a certain amount of dog-wagging when it comes time to chose and carry photo gear. The 500ml water bottle and Hassleblad were both bought after checking to make certain they would fit in the Hadley. When I choose my equipment I simply prefer to use the cameras that will fit comfortably in the Billingham; when I look at other camera bags I can't find any that I would prefer to own or use. Naturally, the Hadley shows some wear and tear after a year's use, but it's nothing extraordinary. I took an opportunity to compare mine to a brand-new bag, and I was surprised at how little difference there was. Yes, my bag (on left, bigger version here) looks a little more 'lived in', with the fabric of the strap and the handle showing a bit of fuzziness, and the leather on the side has been scuffed up. The leather latches that keep the bag closed have worked in exactly as I expected, and there's just a small wear spot on the corner of the lid where the strap rubs against it. Not bad for a bag with a couple thousand kilometres on it, and one that I use as my general-purpose bag most of the time. My Hadley just shows a little bit of character – it's a long way from being disreputable. One feature that separates the Pro from the amateur Hadley models is the top handle. This attaches to a reinforcing strip within the lid, which creates a convenient place to accumulate dust and lint. The bag can be cleaned with a damp cloth, but I usually just dust it off by hand from time to time. It is true that black shows dirt easily, but I love the look of the black fabric with black leather and nickel hardware. Very classy and professional but without drawing any undue attention to itself, and it still looks great with jeans. The top handle is one of the standout features of this bag, and shows no sign of weakness or tearing after my first year with it. I use it all the time, and now I can't imagine buying a bag without a decent handle. In confined spaces, whether a bus, boat, plane, or submarine, it's been an easy way to control the bag and make sure it stays with me, even when I haven't been able to sling it over a shoulder. I use it without thinking and don't notice it the rest of the time. If there's a higher compliment to pay to a design, I can't imagine what it would be. 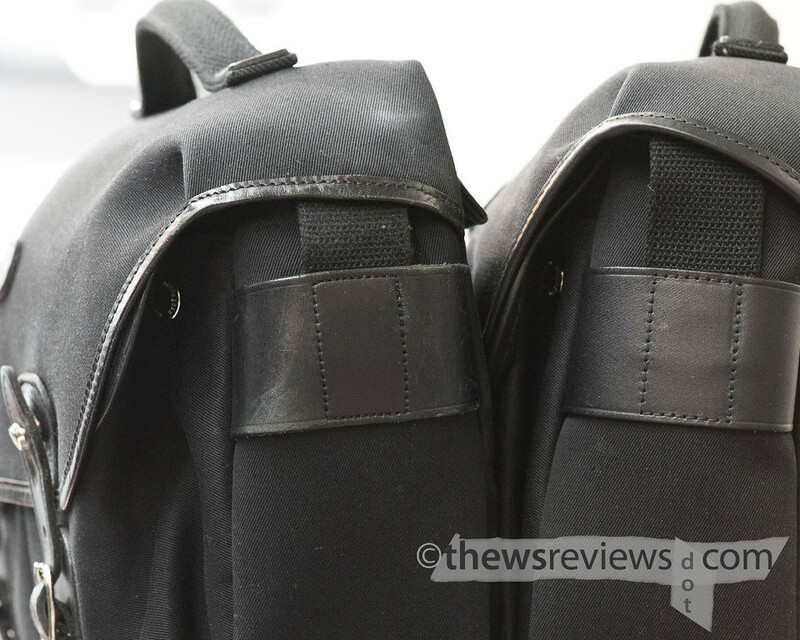 The aspect of the Pro that I initially wasn't thrilled with is the flapped-and-zippered rear pocket. The Domke F6 that I've previously used for travel has a rear slash pocket that's left open at the top, and the flexible bag means that it can hold an airline ticket one moment and a novel the next. That's been very handy when my flight's finally called and I need to rush somewhere after an hour of waiting. The Hadley design is less convenient to use and can't hold as much, but trades that for security that the Domke can't match. The Hadley is unquestionably better when it comes to carrying passports and those other paper extras that shouldn't stay behind in a hotel room, and magazines and novels can slip into its main compartment or a front pocket, respectively. I have gotten used to this slightly slower but more dignified way of storing items, but I still wish that it had an open slash pocket at the back, and slim passport-sized slots within the two front pockets. I hesitate to mention it, because it really is a minor thing of no significance, but I do wish that the pleating on the expanding front pockets would fold down a little more neatly. Even when they're empty, and even when the bags are new, they like to pouch out the way they have in these photos. But then again, I wear button-down collars to work while my colleagues are comfortable in band T-shirts and hoodies, so perhaps I'm a little more – for the sake of politeness – methodical than most. While my Hadley and I were attending PhotoPlus Expo in New York City last year, we were lucky enough to be able to visit the Billingham booth. I was able to spend a few minutes talking to a vice president whose last name happened to be the one on the products. While I know intellectually that Billingham is a family business, actually meeting one of the family came as a surprise. We talked briefly about camera-store retail in Canada, and he gave me the little trinket that I've clipped to the left side of my bag. It's a black leather strap with a nickel stud closure that slips into one of the side attachment points, and originally held a split-ring that I've replaced with a small biner clip. I have no idea what it's actually for – I suspect it's a novelty keyring – and there's nothing like it listed on their website as available for sale. I use it as a place to snap a wet `brolly, and it makes me feel suitably British to be able to say that. While I will pick a different bag if I know that I'll be facing heavy rain, I've never had any problem with the canvas Billingham in the occasional shower. The latches hold securely, and the design of the cover leaves no gaps for water to sneak in through. The material in my bag is still new enough that the Stormblock waterproofing has water beading long before it wets the fabric. Once that effect wears off, the canvas will swell when it gets damp, tightening the weave and blocking water from entering in a way that synthetics can't. So despite the natural fabric and leather trim, this isn't a bag that needs to be coddled or protected from the big bad world, and mine has held up very nicely despite being exposed to the rigours and hardships of normal use. I have met people who are genuinely unable to understand why they may someday own more than one camera bag. I suspect that anyone who has read this far has a small closet with camera bags that don't get used any more, and a small selection of ones that still do. Well, a year with me is like spending several years with a more sensible photographer, so the fact that I still reach for the Hadley first is a major endorsement. Since it arrived in the house I've put away my trusty Domke F6 and used my Crumpler 6M$h only once; the Hadley Pro has taken over all of my small/medium camera carrying duties in addition to becoming my carryall when I don't need something as big as my Timbuk2 messenger bags. The massive Domke F1X is the only other camera shoulder bag that I occasionally still use, while the one camera bag that I bought last year is a Kata 261PL backpack for my Fujifilm GX680 medium format SLR. Every other time that I've felt the pull to buy another small bag I would just end up looking at different sizes of Hadley, and since I already own the best one, I've seen no reason to buy anything else. Despite my love of travel, I don't drive. All of my getting-around is ultimately self-powered, even if that means I have to get myself onto a train or a bus, and I have to carry everything I'm going to need for the entire time that I'm out. Having the right bag is very important, and has a direct impact on my happiness and comfort. Billingham's Hadley Pro isn't the only bag I use, but it's by far my favourite, and there needs to be a reason why I can't use it before I'll carry something else. Even my beloved Domke F6 never crossed over into general use, but I'll still choose my Hadley for those rare times when I'm not bringing a camera. Yes, it's expensive, but if something unthinkable happens I would replace it in a heartbeat. I can't think of much higher praise than that. i've been lusting over billingham bags for about a year now, every few months getting a twinge and going back to the website to look through them all. however every time i decide that they are too expensive and talk myself out of it for another few months. however yesterday at college i spotted someone with a khaki/tan hadley pro and chatted to them about it very briefly. seeing it in person, getting to hold and feel it and the owner's happiness with it all pretty much made up my mind. i just needed a little bit more convincing, and after a bit of googling found your original review of the bag, and then this follow-up. my mind is now fully made up and i am about to order one online. thank you for the detailed and honest review, but especially so for this follow-up. it is as useful as it is rare to find these kinds of longer term thoughts on products, (reviews usually being written after mere days/weeks) something especially useful with objects like this that are intended not only to be used regularly, but also to last. Thanks very much for the comment, I really appreciate it and am glad that my reviews have helped with your decision. 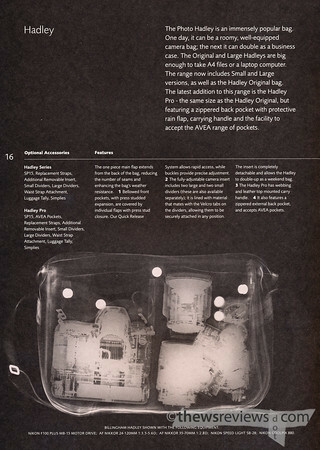 It's also good to know that you were able to see the bag in person, because that sort of experience really helps the Hadley "make sense" in a way that reading about it never will. I find that my Billingham continues to influence my life. I've been shopping for a portable computer to replace my old laptop, and last week I bought the 11" Macbook Air – after I made sure that it would fit behind the Hadley's main compartment. There's no other camera bag that makes me smile the way this one does. I really want this bag now. I keep flip flopping between this Billingham or the large one or the Domke f-5xc. Do you think your Billingham Hadley Pro would fit a T2i with an attached lens and attached battery grip along with a few more accessories? The battery grip may be a problem – the Hadley is a fairly slim bag, and while I can fit a D700 with a lens attached, a Rebel with a grip is taller than that. I'll try it out and let you know; I'll also see what the options are if you're willing to carry the camera without a lens attached. While I don't do that with my Hadley – I use smaller cameras these days – it let me fit a tremendous amount in my Domke F6. Where did you buy the bag from? I'd like to look into the Hadley range in person buy I decide but I don't know any retailer in the GTA. In Toronto you can find them at Merkle Camera, 2555 Victoria Park, and at Aden Camera, 364 Yonge street. I'm considering this bag, and I'm currently using a 400D with a BG, and a Tamron 28-75 f/2.8 attached. Had you tested any camera out in this bag with an attached battery grip? Would very much like to hear how it fares! A digital Rebel with the 28-75 would be okay, and a Rebel with a grip is fine. The three of them snapped together, though, will be a serious problem. Thanks for both these reviews. I had never heard of the Billingham bags when I spotted a Hadley Pro in a Victoria camera shop. The quality and simplicity won me over. I closed my eye to the price and took the plunge. It comfortably holds my D90 with a 18-200 attached, a 80-400 next to it and still has a bit of room left over for a fixed 35. That is all before putting anything in the pockets. For me this is big because I was always having to decide which lens I was going to go out with, or carry the full Lowpro Flipside 400 which is not small. Your reviews really helped me get over the sticker price shock and confirmed a good decision. Cheers. 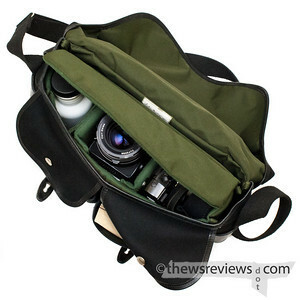 Like others here I very much enjoyed your thoughts and review of the Billingham Hadley Pro. I too had been looking over the past several months for a bag for my Sony Nex 5 system, additional lenses, accessories, iPad, etc. Living in NYC I have the luxury of shopping at B&H which carries a wide range of choices. I began with a Domke F-5XB in wax cotton which I liked but found it a little too snug, especially when I squeezed in my iPad, so I returned it. After reading much praise for Billingham I purchased the Hadley small. I immediately took to the amazing quality, design and craftsmanship of the Billingham. Something however was not quite right. Although bigger than the Domke it was still a little on the small side and didn't give me much room to grow. Back to B&H to make the exchange for the Hadley Pro. Like you I found bag-nirvana with this one. The Pro had it all, enough space for my current kit, room to grow, that perfect handle and the rear zip pocket which is perfect for my iPad. Being able to pull out the padded insert and use this bag as a business case was the proverbial icing on the cake! I chose khaki with tan trim (my personal favorite) but can see how each color could appeal to one's liking. The only left for me to get is the SP40 shoulder strap. I suppose I could also get the Avea side pouches (another benefit of the Pro model) but will probably wait until there's a specific need for them. To sum it up this is a GREAT product, one which puts a smile on my face every time I use it. Can't really say that about a lot of things these days. Andrew, thanks for the great comment. I always appreciate hearing other people's experience, especially when they're happy. The SP40 is a very good strap pad, but I've never felt the need to add it. I rarely carry more than eight or ten pounds in the bag, and when I do I want to be able to switch the bag from side to side. The way the pad attaches makes it difficult-to-impossible to slide the strap pad from one side to the other - it can't pass across the part where the strap is three layers thick. So when I need it most, it's at its least useful. Hi Mathew, just read this article and I must tell you that I bought the Hadley Billingham (small) bag in London in 2010...just what the doctor ordered for an Olympus E-P2 plus four other lenses and bits and pieces...I wouldn't trade it for any other make...I just wish it had a handle on it like yours! Just bought one of these. Had been thinking about this type of bag for a while and living in the UK and having used a very small Billingham for a number of years knew what quality they were. Reading your initial and 1 year on reports were very instrumental in making my mind up. As a matter of interest, in the UK, the price difference between Domke and Billingham bags of a similar size and capacity is not as great. The Domke 803 being around 135 GBP and the Hadley Pro around 149 GBP. But the extra quality of material and attention to detail of the Billingham is easily worth the extra. Anyway, on to my main point of writing this. Seeing your little clip which you got from Billingham set me thinking. Billingham do Avea pouches which clip on at the ends, but are pretty expensive. I have several small lens pouches which attach to belts or other bags with velcro strips. I have cut some narrow black webbing to about 18 inches long and added a sliding ladder lock to one end. The open end is fed through one of the open slots at the end of the bag, then back up the other slot and through the ladder lock. This leaves 2 loops to feed the back of the lens pouch through and fasten with the velcro. I can also fit a water bottle in here if I want. I have enough length in the webbing to loosen off and feed an umbrella or small waterproof throught the loops and tighten so they don't flap about. Hope you understand, but I have some photos I could send if you like. Thanks again for your excellent and considered reports. Excellent reviews I finally took action and bought a Hadley Pro after reading both reviews. It's a great bag. I do have a BillyPad for it. Interesting...my Hadley Digital carries a D300S + grip, with 18-200VR mounted, better than the Hadley Pro. Glad I read your review. Glad I have my Hadley Pro. Hello and thank you for your reviews. Like many other rreaders here, your nicely written reviews helped me to decide that I should buy this bag. Juste ordered one Hadley Pro in Canvas black/black this morning. A new home for my light setup D700/50mm! It carries my dslr without grip perfectly. It carries my Olympus OMD with 2 lenses well, even with the grip installed.